Elaborate shapes. Emphasised by the gentle linearity of a satin strap, the case creates an oval with perfect proportions, while the entire circular dial is adorned with sapphires in varying shades of blue. 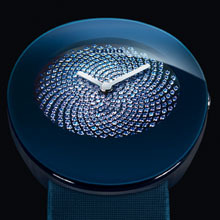 Set in a Fibonacci spiral derived from the golden number, they bring a mythical balance to the subtle harmony of blues. Flowing. Refreshing. Simply precious. On the surface of the dial, time is reduced to the essentials. Two silvered hands alone highlight the sparkle of its geometrical scrolls. 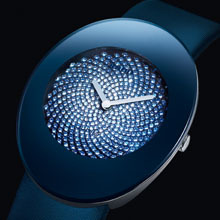 They circulate serenely under the curved, edge-to-edge sapphire crystal with its metallic blue finish. 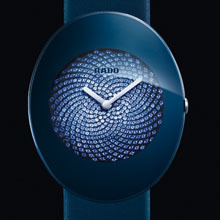 The discreet crown is partially hidden under the case band: a detail that completes the perfect integration of the elements and exemplifies the signature of the Rado legend. Refined and geometrical, a watch of rare sophistication. The calm essence of blue. The essence of beauty.